Group of us 5 girls stayed in 2 double rooms. The beds are so big we could have shared the one room! Each room had two super king sized beds together under a four poster. It is exactly what u think a castle would be like and it doesn't pretend to be anything else. Lovely stone walls and mismatched furniture gives the room it authenticity. The cobwebs were a plenty but that was ok too? Staff were fantastic and the food was superb. The dungeon bar was a great treat with fabulous atmosphere and trad music a plenty. The only slight disappointment was the EV charging was not working. Had to leave early to get my car charged for the day ahead. 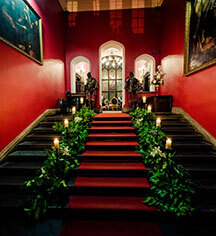 We visited Kinnitty Castle this past Saturday night. 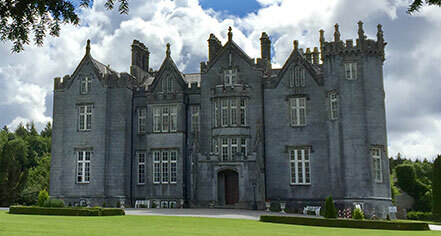 Both tourists and Irish visitors will find this place to be a truly authentic castle stay. The room allocated to my boyfriend and I was simply sensational. For a very reasonable upgrade fee, the staff gave us one of the suites in the main castle. I would advise any potential visitors to request this, as there is a remarkable feel in this part of the building. Our room had a wonderful sitting area, chandelier and a magnificent freestanding bathtub in the bathroom. A tastefully appointed room in every respect. The castle hotel offers wonderful walks in the vicinity, with unspoiled forests and trails abutting the building. We had a marvellous walk, even though it was raining, and the staff helpfully provided us with umbrellas. All the waiting staff and the staff at reception gave us a hearty welcome. The food in the Dungeon Bar and the breakfast was of superb quality. And we unashamedly hogged the wonderful coal fire after dinner. But visitors will find coal fires stoaked throughout the building, and there is a lovely one in the bar/library room. Thanks to all who work in Kinnitty for a memorable stay and we shall be back! systematic and uncaring. A big institution out to grab your cash - don't bother. It may look fancy on the outside, but that's about it. Drive another 10 minutes or so into Birr and book into the lovely Spinners B&B instead. We didn't stay at the hotel, though it looked very interesting. We did eat a late lunch in the Dungeon Bar, a labyrinthine series of rooms under the castle. The seafood chowder was very good and we enjoyed the atmosphere. My husband and I got married at Kinnitty Castle and we couldn't have been happier with the service and accommodations at this historic site. From the moment we pulled up to the castle, our breaths were taken away. Pictures do no justice to how beautiful this place is! The rooms felt authentic to the history, but still allowed a modern comfort which made for a fantastic stay. Every crevice of the castle will leave you awestruck. We would like to give special mention to Peter, Connor, Luke, and John as well as the staff of the restaurant who added special memories to our perfect wedding day.